The thumb-nail images in this article may be double clicked and viewed full screen. The Second World War took the CBC into international short-wave broadcasting. In 1942, the government authorized establishment of the CBC International Service, to be operated for Canada by the CBC, but completely and separately financed by Parliamentary grants. Construction of two 50-kilowatt transmitters began in 1943, near Sackville, New Brunswick, where the Tantramar marshes have proved to be one of the best short-wave transmitting locations in the world. Headquarters were set up in Montreal, and programs fed to Sackville, some 450 air miles away, by landline. 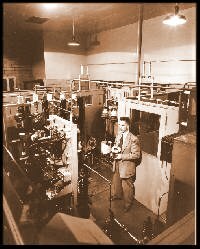 After test transmissions in 1944, the short-wave service was officially opened in February 1945, with programs directed to Canadian troops overseas and to European listeners. 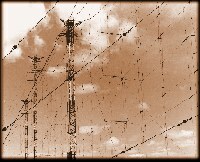 Within a few months, regular transmissions had been added in Czech, Dutch, Spanish and Portuguese, and programs were beamed to Latin America and the Caribbean as well as Europe. The huge curtain array may be seen for miles across the salt flats and is capable of operation from 3.9 to 26 MHz. This array is still in service today with it's hundreds of guy and support cables requiring constant tensioning to maintain the mechanical integrity. One of the walk in Power Amplifier sections of this RCA 50T transmitter is still on exhibit at Sackville. 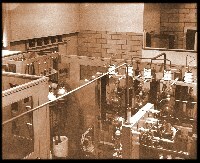 The high voltages required to power this monster transmitter was supplied from the Power Supply Room pictured below. The huge 857B Mercury Vapour tubes and heavy duty buss bars make this HV room look like an Electrical Sub-Station. Today, from this site Radio Canada International broadcasts at power levels of up to 500,000 watts to all corners of the world. Visitors, incidentally, are always welcome at Sackville. If you plan to be in Atlantic Canada and would like a tour of the station please write to The Manager, RCI Shortwave Transmitting Station, P.O. Box 1200, Sackville, New Brunswick, Canada E0A 3C0. You can also take a virtual visit via the Radio Canada International web site for more background history on CBA.